An initiative by Taiwan’s president offers what is surely the most effective solution to the dangerous dispute. In recent media statements, Japanese Prime Minister Shinzo Abe reiterated that Japan has to increase its defense preparedness to secure Japan from threats, and to allow it to play a greater role in international security. Abe explicitly warned that Japan would not allow China to make any changes by force to the territorial status quo of the region. In doing so, he raised the prospect of Chinese drones being shot down over Japanese territory, to which China angrily responded that any such action would be an act of war. 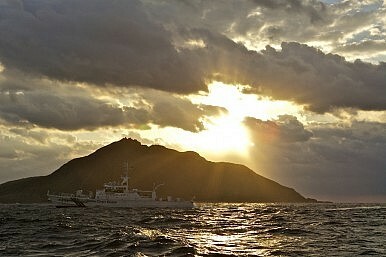 This escalation of rhetoric over the disputed Senkaku Islands, claimed as the Diaoyus by China (and Taiwan), continues the near-constant confrontation between maritime security forces of China and Japan in the waters and skies surrounding the islands in the East China Sea. The tension has only increased since the former Democratic Party of Japan government nationalized the islands, purchasing them from private owners in September last year. China and Japan have well-known differences over history and territory, but the most pressing today involves the disputed islets, which Japan controls but which China and Taiwan both claim. Last month, Abe issued a fresh warning to China on its increasing maritime activities in the area. The danger now is that the risk of an accident, miscalculation or even a shooting incident rises with each Chinese foray near the islands. The conflict has created an explosive situation. As a first step, the disputants should acknowledge the islands' disputed status. They should then agree to shelve the dispute. The parties should agree that they will not dispatch aircraft or ships to make shows of force or to test the waters. Politicians must acknowledge the islands' disputed status, either verbally or in writing. This will avoid risk to their aircraft and ships. In the waters and skies around the disputed islands, China is escalating efforts designed to challenge decades of Japanese control. As Beijing pursues a policy of maritime expansion, it is using a familiar rhetoric of victimization. It is accompanying this campaign with increasingly blood-curdling rhetoric, warning of a coming clash that could be as calamitous as that last one was. For now, armed conflict between Japan and China over Senkaku islands still seems improbable, but the quarreling over the uninhabited rocks carries an inherent risk that it will get out of hand. Indeed, the rising tensions are making a military clash ever more likely. That would imperil not just China and Japan but the region’s peace and its momentous economic advances. The Obama administration says its pivot to Asia is designed to engage the most dynamic region in a world still struggling to emerge from the global financial crisis. The United States, and the world at large, has a duty to warn China and Japan before it is too late. Yet warnings are often interpreted as conspiracies. So who can speak out against this unfolding madness? The United States, China and Japan should pay serious attention to Taiwanese President Ma Ying-jeou's call for talks among the stakeholders to discuss jointly developing the seas around the disputed islands and shelving the sovereignty issue. Ma's initiative – known as the East China Sea Peace Initiative – calls on all parties to refrain from provocations, set aside their differences, maintain dialogue, observe international law and resolve the dispute through peaceful means. All parties concerned should work together to achieve the aims of the East China Sea Peace Initiative as soon as possible, so that the region “can become a sea of peace and cooperation.” Ma's initiative, which accords with Washington’s stance on the issue, is surely the best way to address the Senkaku/Diaoyu dispute. Kent Wang is advisory commissioner for the Overseas Chinese Affairs Council of the Republic of China (Taiwan) in the United States, who publishes frequently on the Taiwan issue in Sino-American relations, as well as other topics on East Asian international politics and regional security. He also sits on the Board of Executive Directors of the Taiwan Benevolent Association of America and is active in his community.